This is Prophets Russ and Kitty Walden! 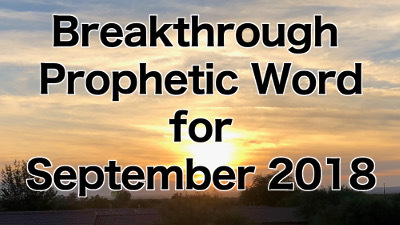 Below you will find the video for the September 2018 Breakthrough Prophetic Word over your life! (Transcription Included!). The Father says today that I am manifesting in your life this month the ENORMITY of My favor and the MAGNITUDE of My grace poured out upon you in an UNPRECEDENTED manner! Command your eyes to see and your ears to hear the sound of the heavens opening on your behalf. I am a big God, and in the next few days and weeks, I am opening wide the doors of opportunity and vision in your life. This is not a time for small thinking! Lift up your head says the Father and expect big moves and a massive shift of things pertaining to you directly into the path of your manifest destiny. This is not a time of holding back or giving in to coping strategies or just surviving. Deal with all distractions says, God. Militate against the distractions the enemy is sending your way. When the little foxes and diversions of the adversary pull on your attention – sweep them away with the determination of your faith. Say to those enemies of faith that have snared you in times past “not this time…” You will no longer be delayed. You will no longer be denied. The curse is broken. The curse of the enemy through the mouths of those speaking against you that do not have My vision for your life is broken EVEN NOW says, God. The blessing is yours. This day I move you into your blessing place. This day I cause you to spring up like a root out of a dry ground. Your desert shall now bloom says the Father. You will see in this time frame the seed, fruit, harvest of My promise even those promises you have long held on to and wondered “Father is this ever going to come to pass? Is this thing ever going to be made manifest?” My answer is YES toward you. You are stepping now into My YES and AMEN! Rejoice says God for the ancient covenants of promise are being fulfilled in your life. You are stepping into your NOW and moving into the experience of FULL ENTITLEMENT in My kingdom – even the entitlement of sons paid for on the cross 2000 years ago. This is the day and the hour that the full dividends of the cross are being paid into your life as the plowman overtakes the reaper and the seeds of your sacrifice and obedience produce a harvest even before they hit the ground! Sow into the arrival of that spouse you have been believing God to give you. Sow into the job situation you absolutely need to see changed. The website again is propheticnow.com. Does this Word Resonate with You? Thank you for obeying God.